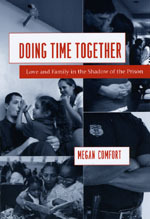 Megan Comfort spent years getting to know women visiting men at San Quentin State Prison, observing how their romantic relationships drew them into contact with the penitentiary. Tangling with the prison’s intrusive scrutiny and rigid rules turns these women into “quasi-inmates,” eroding the boundary between home and prison and altering their sense of intimacy, love, and justice. Yet Comfort also finds that with social welfare weakened, prisons are the most powerful public institutions available to women struggling to overcome untreated social ills and sustain relationships with marginalized men. As a result, they express great ambivalence about the prison and the control it exerts over their daily lives. YES! Magazine‘s Beyond Prisons issue features articles on Washington State’s prison university program, Maori responses to youth crime, Hawaii’s women’s prison, and more. For activists, organizers, etc. : YES! licenses all its content through Creative Commons, so you can reprint the articles in your own publications without worrying about copyright. Just make sure you follow the magazine’s reprint guidelines here. Reason Magazine‘s Criminal Injustice issue includes pieces on the California prison guards’ union, the relationship between incarceration and the crime rate, sexual assault behind bars, the immigration detention system, and more. I’m glad to see publications from across the political spectrum taking up the cause of criminal justice reform. The Los Angeles Times has a fun (frightening?) interactive tool where you can try your hand at eliminating California’s deficit, limiting yourself to options actually on the table in Sacramento (if I understand the tool correctly). Here’s my stab at balancing the budget — note: these aren’t necessarily my considered policy preferences, but just my first stab playing around with the tool with a special eye toward prisons, the fastest-growing component of California’s spending commitments. The tool graphically illustrates how hard it would be to make the necessary cuts if you have any level of commitment to public education and welfare programs — and if you know what kinds of cuts/fee hikes California’s K-12 schools, community colleges, and universities have already endured. Finally, the tool shows just how much of California’s budget is currently being sucked up by its counterproductive sentencing policies. The option on the table is to reduce the prison population by 40,000 inmates, but that still leaves over 100,000 inmates behind bars and the state’s bloated prison system basically intact. FYI: the Alcohol & Drugs History Society has launched a new blog, Points.